Box Text: For the first time, become a Master Assassin on the PSP system. I will travel to the distant land of Cyprus to dispose of the remaining Templars before they rebuild their Order and hunt us again. I am Altair. I am an Assassin.Use Altair's signature moves against intuitive enemies. Free-run and climb everywhere in a stunning open-world environment. Continue Altair's mission against the Templars in an all new story. Unlock and share EXCLUSIVE CONTENT when you connect your PSP system to Assassin's Creed II on PS3. 09-05-2011 scott Box Text For the first time, become a Master Assassin on the PSP system. I will travel to the distant land of Cyprus to dispose of the remaining Templars before they rebuild their Order and hunt us again. I am Altair. 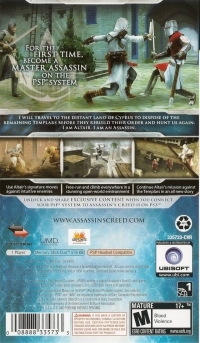 I am an Assassin.Use Altair's signature moves against intuitive enemies. Free-run and climb everywhere in a stunning open-world environment. Continue Altair's mission against the Templars in an all new story. Unlock and share EXCLUSIVE CONTENT when you connect your PSP system to Assassin's Creed II on PS3. 09-05-2011 scott Box Text For the first time, become a Master Assassin on the PSP system. I will travel to the distant land of Cyprus to dispose of the remaining Templars before they rebuild their Order and hunt us again. I am Altair. I am an Assassin.Use Altair's signature moves against intuitive enemies. Free-run and climb everywhere in a stunning open-world envoriment. Continue Altair's mission against the Templars in an all new story. 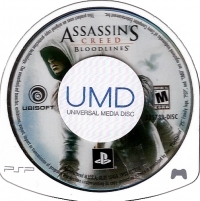 Unlock and share EXCLUSIVE CONTENT when you connect your PSP system to Assassin's Creed II on PS3. 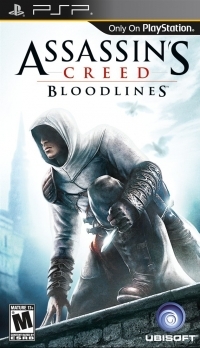 This is a list of VGCollect users who have Assassin's Creed: Bloodlines in their Collection. This is a list of VGCollect users who have Assassin's Creed: Bloodlines in their Sell List. This is a list of VGCollect users who have Assassin's Creed: Bloodlines in their Wish List.